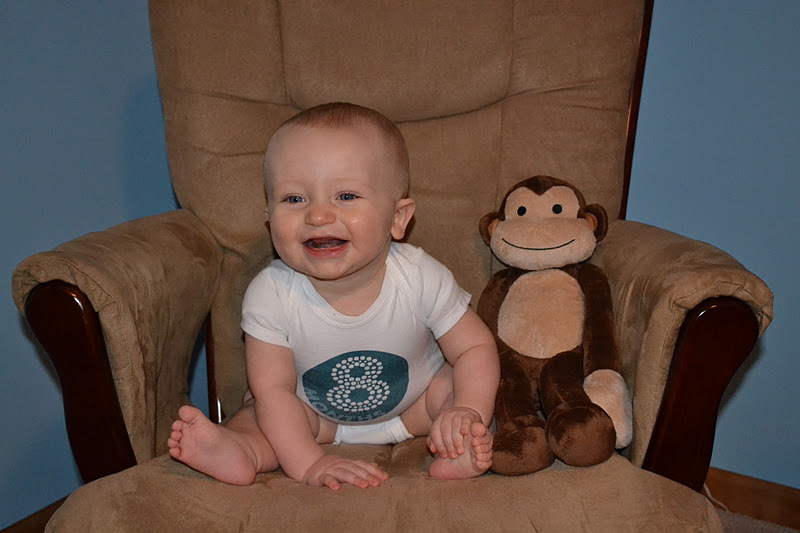 K is 8 months old today! He is becoming such a little boy! Our “baby” days are quickly passing. I am both saddened and excited by that. 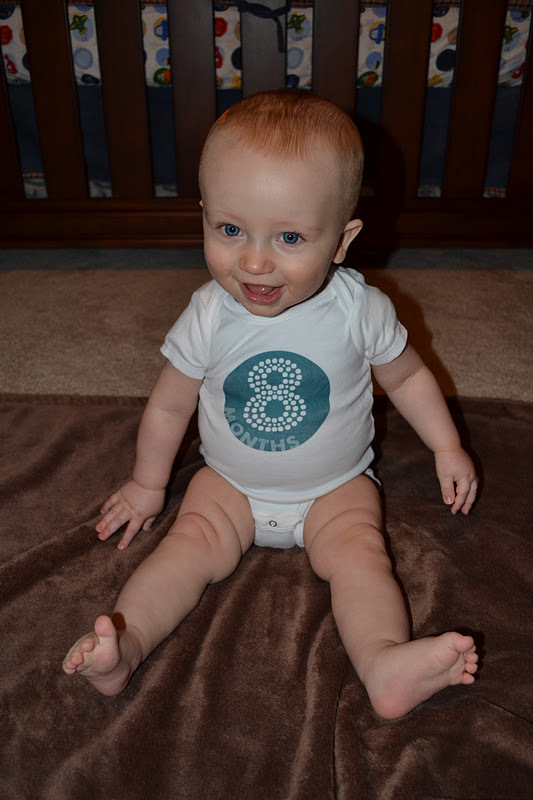 Here are some fun facts and figures about 8 month old K.
·He weighs roughly 20 pounds. ·He eats anything and everything, and as much of it as we are willing to give him. In fact, he makes “mmm” sounds the whole time he eats. It’s adorable. ·His favorite foods are pretty much any fruit and sweet potatoes. He has recently tried stage 2 mixes such as apples and chicken, and turkey and sweet potatoes. And he’s finally coming around to love puffs! ·He sleeps through the night (8:30pm to 7:00am)…as long as he is healthy. 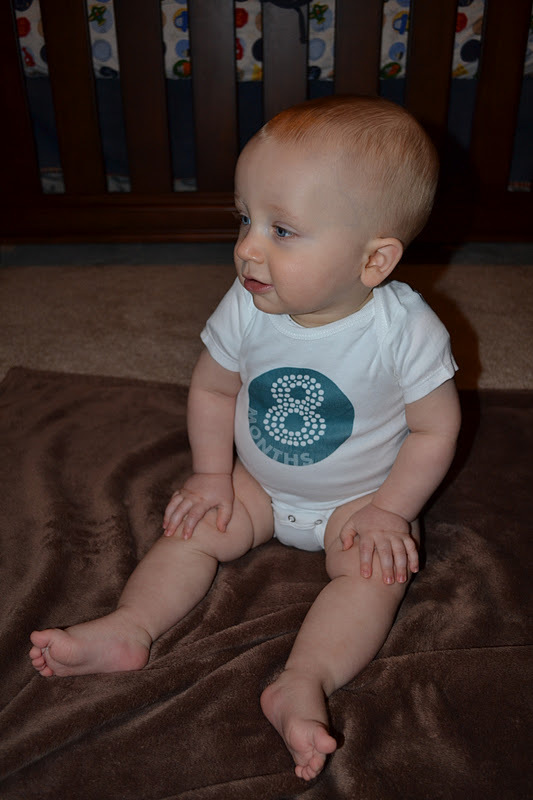 ·Speaking of being healthy…in the last month K had a virus, and even worse, the dreaded ear infection. Little man does NOT handle the ear infections well. ·As soon as we lay him on his changing pad, he reaches backward for the yellow tube of cream, and the shout wipes. 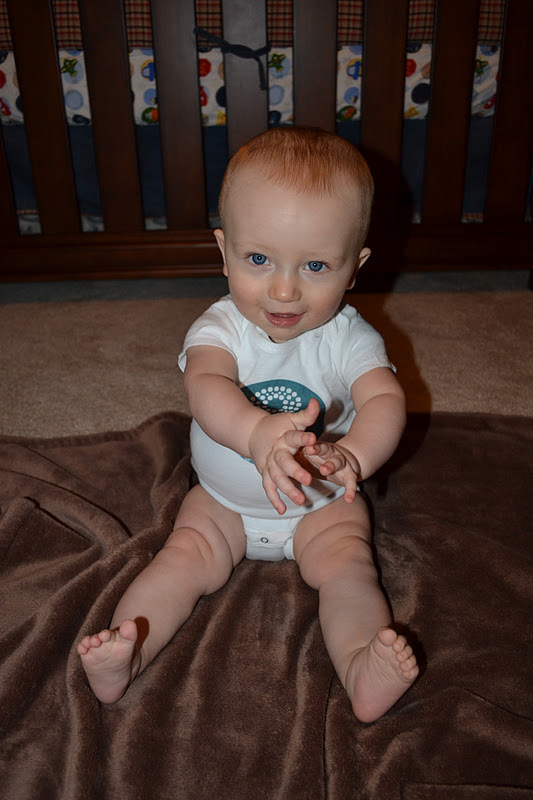 ·He sits up like a champ! He started sitting independently right after his 7 month update. But he’s a pro at it now! 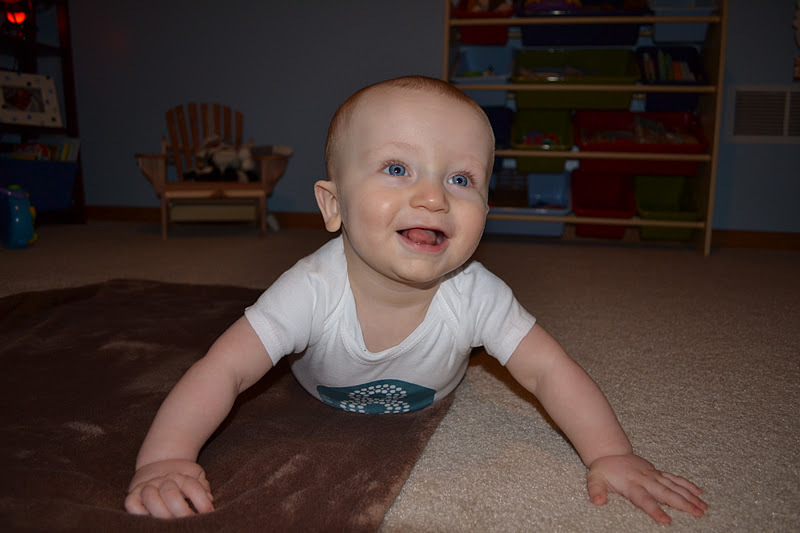 ·Still no crawling. If we put him on all fours he will rock, then spread eagle on to his belly. He’s not a fan of either of those positions. 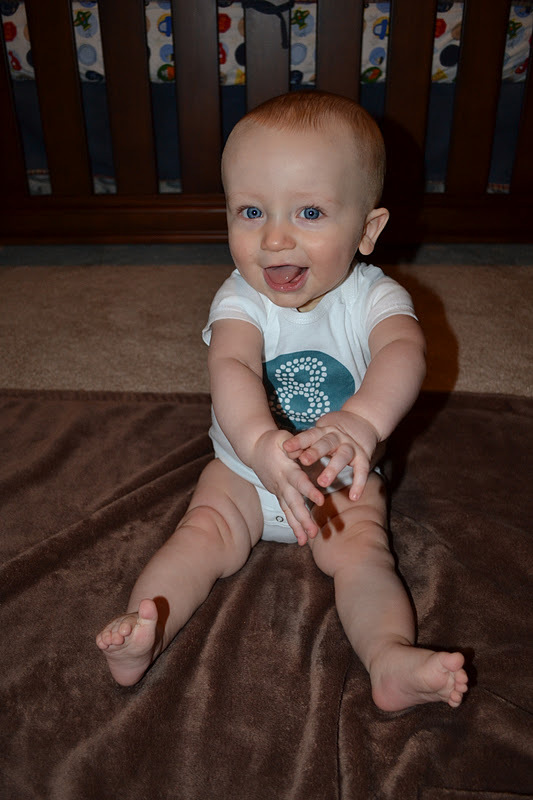 ·He claps on his own now (albeit awkwardly), and loves playing Pat-a-cake. ·He loves the outside. He stares longingly at the green grass when he’s near a window, and he’s always up for a stroll around the neighborhood. ·His favorite book is still 10 shiny snails, but he also enjoys waterproof ones for gnawing on. 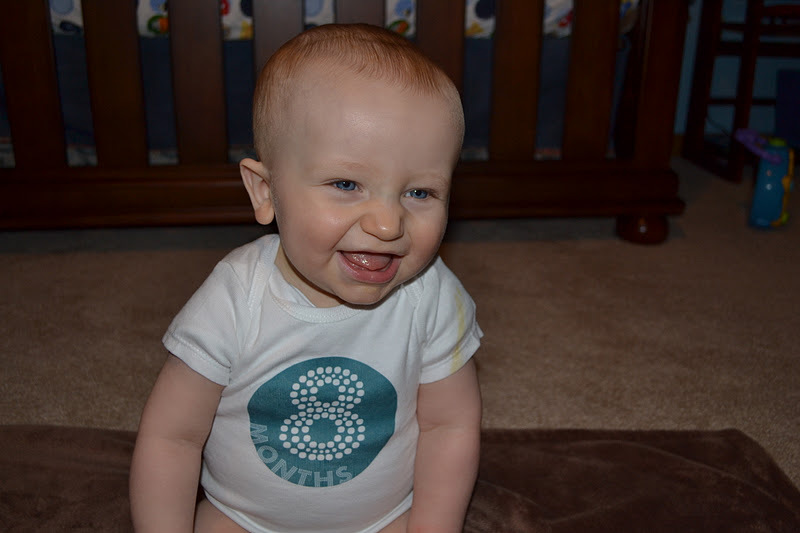 ·Speaking of gnawing…he has two teeth poking through on the bottom! 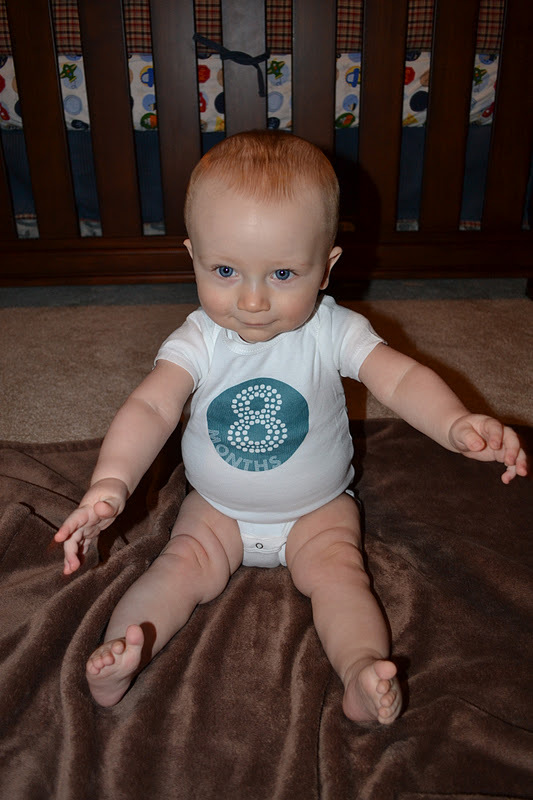 ·He wears size 3 diapers, and 6-9 and 9 month clothes. 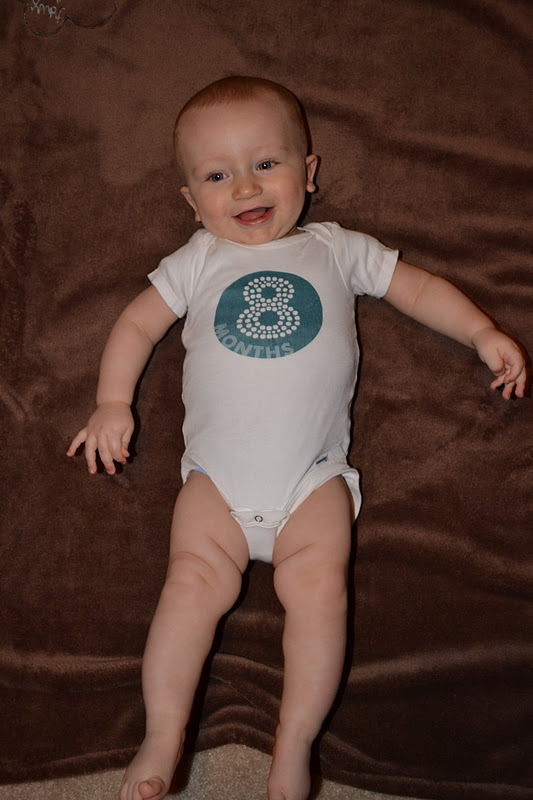 He’s outgrown several 6-9 month items. K’s first trip to the pumpkin patch, and misinterpreting a dirty diaper for hatred for the corn box! The first time he clapped on his own for Pat-a-cake. The way he greets me with a squeeze and zooms in toward my face with an open slobbery mouth. The way he greets daddy with a huge grin, kicking legs, and a few firm pats on the face. The way when he’s really sleepy he talks and jabbers himself to sleep. How perfect he is, and how we can’t imagine life without him. And here’s this month’s photo shoot. It seems we have officially outgrown the lay on the blanket routine. Remember to click on any photo to see it larger. Love the pictures. I especially loved the pumpkin patch ones. Karson is sooo squeezable! 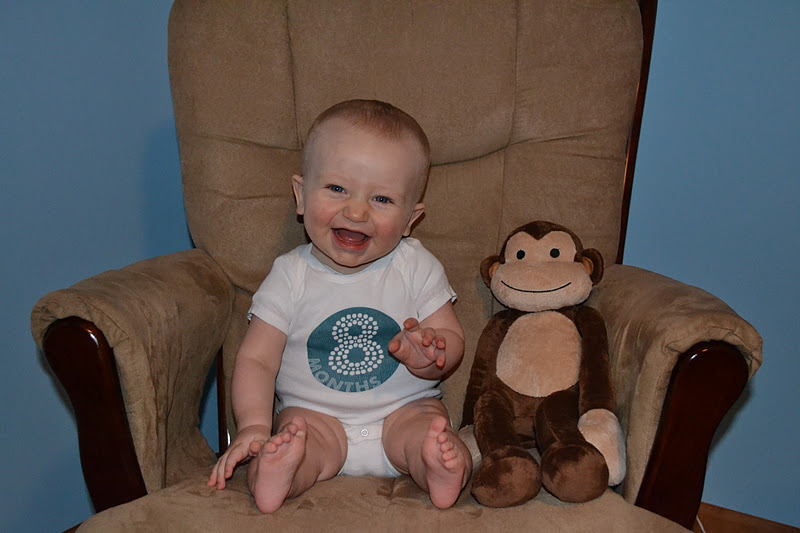 It is hard to believe that Karson is 8 months old! Time flies!! He is the cutest baby!! He is a lucky baby to have parents like you two! !